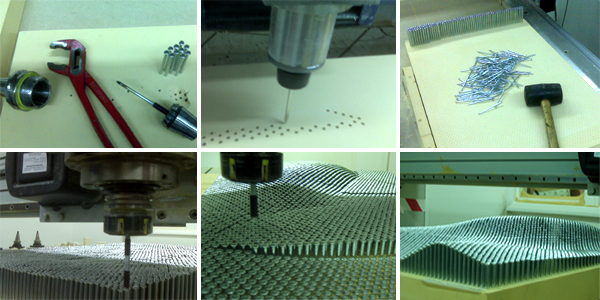 Project to create the annual CNC piece for the AA Projects Review exhibition, simultanuously investigating the possibilities to create an adjustable mould using a grid made out of stainless steel nails and a scripted workflow generating custom g-code, using the existing camtech CNC machine as a nail-pushing machine. 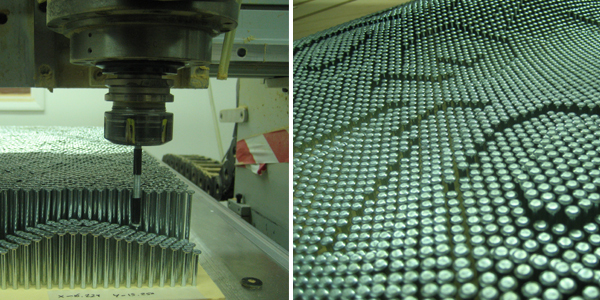 The surface formed by the grid of nails could be used as a mould to cast or form on, after which the nails could be reset to their original (top) position and the process with the CNC adaptation could be repeated with a different pattern. Intended for exhibition, the nails of this piece were fixed in position applying a coating of bioresin on the back side. A number of hardware tools and scripts were created for this project. For the drilling of the holes one of the nails was mounted in the collet, and for the pushing of the nails a standard threaded rod was used while keeping the spindle switched off. A simple script in MEL was used to translate the coordinates of a series of points in the same grid as the nails to G-code formatted in the syntax of the specific machine. 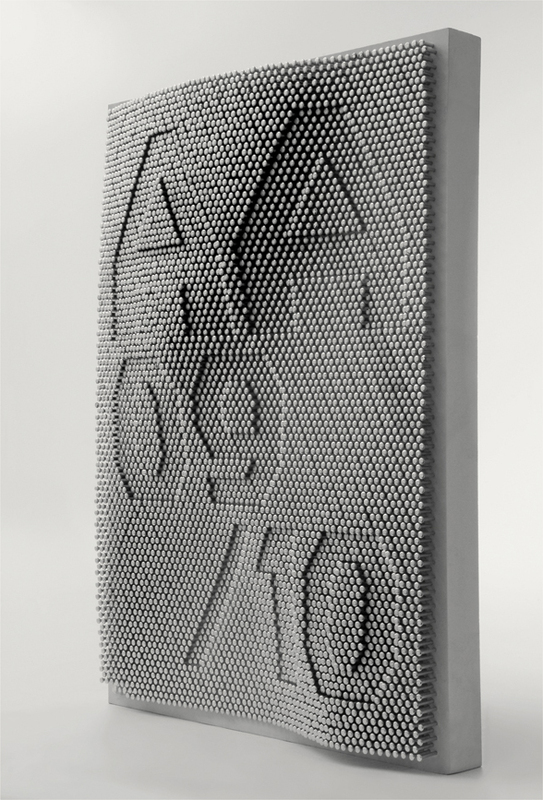 The grid of points had been projected on a double curved surface in Maya and are featuring graphics specifically designed to match with the nail pattern.